HÀ NỘI – Two years ago, Asia-Pacific lost US$126 million a day due to natural disasters. In 2016, 0.4 per cent of the Asia-Pacific region’s GDP was lost to natural disasters, with some 11.2 million people displaced. By the year 2030, GDP losses are estimated hit 1 per cent. In percentage of annual capital investment, 2016’s loss amounted to 5 per cent of the figure, a very high number compared to other parts of the world such as Europe and Central Asia. Many ASEAN countries are among the most affected by climate change, especially the Philippines and Việt Nam, said a report by the United Nations International Strategy for Disaster Reduction (UNISDR). Rapid urban development contributed to the issue as ability to build resilience isn’t keeping up with growth, creating more risk. When natural disasters occur, it is often the most vulnerable such as children, women and the indigenous that are most severely affected. This, in turn, hampers the nation’s effort to reduce poverty. 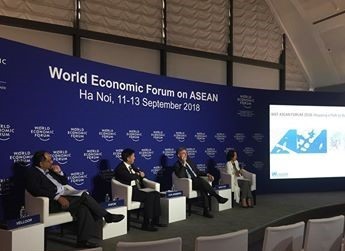 The report was represented to panellists and audience during a conference themed ‘Mapping a path to regional resilience’ during the ongoing WEF on ASEAN 2018 on Wednesday in Hà Nội. Mami Mizutori, UN Special Representative for Disaster Risk Reduction, urged ASEAN’s governments, the private sector, civil societies and all stakeholders to invest in making the region more resilient to natural disasters. "Businesses have to consider that disaster risk is as important assessing the economic stability, political stability of a country or a location you’re investing in," said Mami Mizutori, UN Special Representative for Disaster Risk Reduction. Other panellists suggested societies as a whole with the support of modern technology must drive efforts to seek solutions to mitigate the damage caused by natural disasters and climate change. They recommended that building resilience to natural disasters be at the centre of urban planning and development and initiative must be taken by policymakers and financial institutions to encourage projects that contribute to realising that objective.